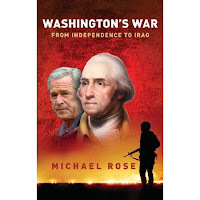 With all of the fuss currently in the press about US General Jack Keane's opinions about the British tactical 'failure' in Basra, it is appropriate that I have just finished General Sir Michael Rose, KCB, CBE, DSO, QGM's book "Washington's War" about the American strategic failure in Iraq as a whole. Although the cover suggests otherwise, this is not really "A Tale of Two Georges" - the adventures and tribulations of George Washington and his fellow revolutionary generals, including Osama's predecessor as the hate figure for all rootin' tootin' apple-pie eatin' Yankees, Benedict Arnold, are covered in detail but if anybody from the Bush administration gets rocketing, it is Donald Rumsfeld and, to a lesser extent, General Tommy Franks. There are interesting moments of comparison between George III and George Bush, a detailed history of the War of Independence and some insights into the difficulties of peace-keeping against a counter-insurgency movement in modern times. The direct equating of the Continental Army with the Iraqi insurgencies (and the state militias with their Iraqi tribal and religious counterparts) is not going to make it comfortable reading for gung-ho supporters of the war in Iraq, nor is the comparison of the British Army and politicians in the 1770's with their modern American counterparts. This is a short, scholarly and, overall, interesting book. At £14.99 (or £10.49 from Amazon) in hardback, it is currently one for the military historian or enthusiast rather than a more general (no pun intended) reader, who may wish to wait for the paperback.